Any traveller with even a slight affinity to Japan dreams of wallowing among the blissful cultural treasures of Kyoto. Fewer are aware that its close neighbour of Osaka, a city more associated with its modern Japanese sensibilities than its past, sports quite a few of its own. Among the most compelling things to do in Osaka is to take break from its big city buzz to scope out some of the beautiful temples & shrines of Osaka. While they might not match the grandeur you’d find in nearby Kyoto or Nara, they’re certainly worth getting know and offer a fascinating glimpse at the ancient history of a city that seems anything but. Just steps away from the neon-blasted action of the entertainment district of Dotonbori, Hozen-ji Temple is a island of calm in the heart of city. Dating back to 1637, Hozen-ji is famous among Osakans for the moss-covered Mizukakefudo, a statue of depicting one of the five Wisdom Kings of Buddhism, Fudo Myoo. Adding to the intrigue is that the statue was one of the only things in the area to survive the WWII bombings of Osaka. It’s no wonder that devout Buddhists adore Mizukakefudo as they do, worshipping the statue by gently splashing water on it under the faint glow of paper lanterns. While visiting Hozen-ji Temple, don’t miss out on Hozen-ji Yokocho. This narrow alleyway forming the approach to the temple is lined with dozens of restaurants & bars that offer some of the best food in Osaka and harken back to the look & feel of old Osaka. From Namba Station, take Exit 14 on Mido-suji. Turn at the side street straight ahead and walk straight until it crooks into an alleyway. You’ll find the temple on the straightaway around the first bend. Founded in 593, Shitenno-ji Temple is one of the oldest temples in Japan and an absolute must-see while visiting Osaka. Much has changed at this temple complex over its more than 1,400 years of history with several reconstructions—the most recent in the post-WWII period—painstakingly done to recreate the spirit of the original. Among the highlights of Shitenno-ji are its 13th-century stone Ishii-no-torii gate, five-storey pagoda, treasure hall, and Main Hall (Kondo) where Prince Shotoku, the temple’s founder, is enshrined. Perhaps best of all is the Gokuraku-jodo Garden, a beautiful Japanese garden inspired by the west that features ponds, pathways, and one of the best viewing spots for cherry blossoms in Osaka. Visiting via Osaka public transportation, the closest station to Shitenno-ji is Shitennoji-mae-Yuhigaoka Station on the Tanimachi Line. From Exit 4 walk south along the smaller street running parallel to Tanimachi-suji. The temple’s stone torii gate will be about four blocks ahead on your right. Burrowed down on a site with 12th-century roots, Isshinji Temple is easily one of the most unique you’ll encounter on your trip to Japan. A modern sculpture, fashioned from steel bars and sheets of metal, greets you at the temple’s gate, confusing visitors with the stark contrast to the place of worship lingering just past. Unlike other temples in Osaka, what makes Isshinji Temple so compelling isn’t simply its outward beauty but the uniqueness of the treasures inside. The temple features Okutsu Butsu, a practice where human bones are mixed with clay and sculpted into statues and relics. Within Isshinji Temple, you’ll encounter 15 Okutsu Butsu statues collectively containing the remains of over a million people. Grab the Osaka subway to Tennoji Station, exiting into Tennoji Park. 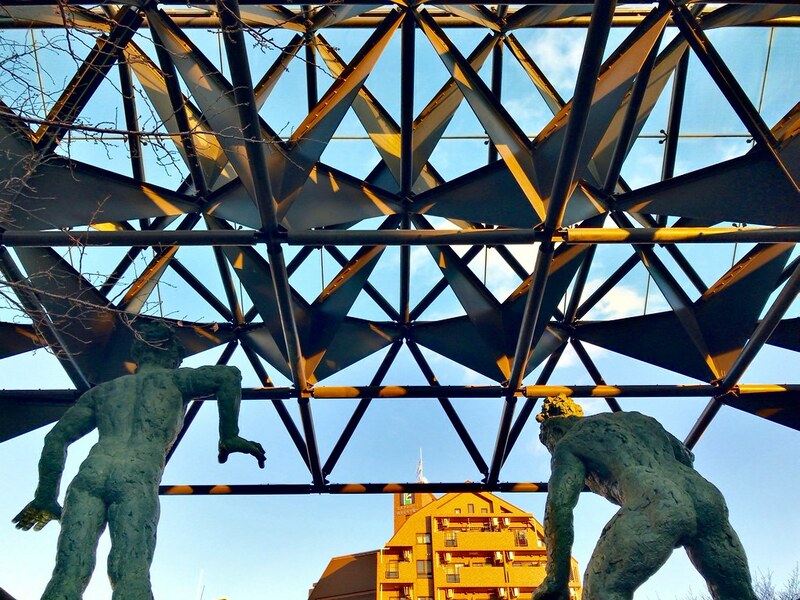 Walk through the middle of the park, passing by the Osaka City Museum of Fine Arts. The temple entrance sits on the northern edge of the park. 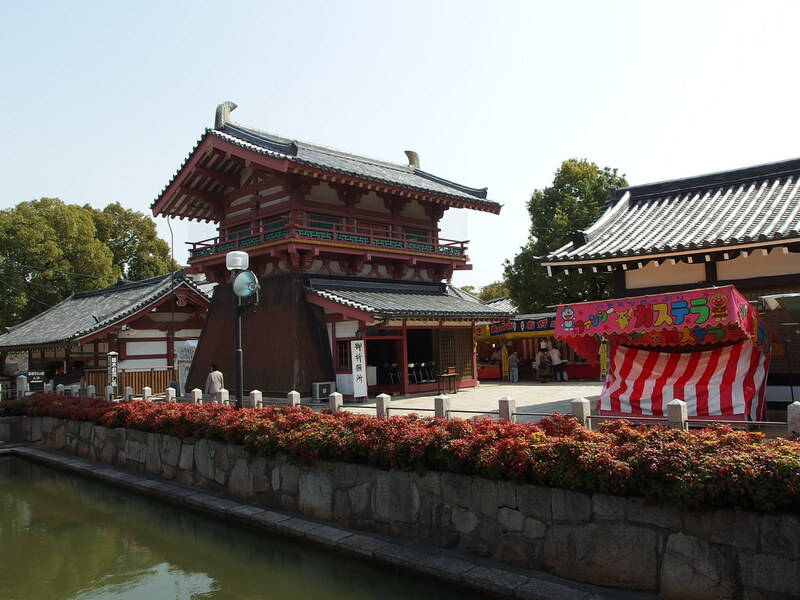 Not just one of the most important shrines in Osaka but in all of Japan, Sumiyoshi-taisha Shrine is the granddaddy of all the 2,300 or so Sumiyoshi shrines throughout the county. Over 1,800 years of history pile up behind Sumiyoshi-taisha, predating the arrival of Buddhism in Japan for a look and feel that’s uniquely Japanese. The shrine’s distinctive architectural style, sumiyoshi-zukuri, features straight, as opposed to curved, roofs punctuated by forks (chigi) at each gable and five horizontal supports (katsuogi). Throughout the shrine complex, you’ll catch sumiyohi-zukuri in action including at its four main halls (honden). Sumiyoshi-taisha sits a little outside the centre of Osaka, about 5 kilometres south of Shinsekai, making it hard to throw into your plans if you’ve only got one day in Osaka. The easiest way to get to Sumiyoshi-taisha is on the Nankai Main Line from Namba Station to Sumiyoshitaisha Station. The ride costs ¥210 and the journey is just ten minutes. Alternatively, if you’re already in Tennoji, take the Hankai Tramway from Tennoji Station. Exit at either Sumiyoshitoriimae Station or Sumiyoshi Station. The journey takes 15 minutes and costs ¥210. Over 10 centuries of history stand behind Osaka Tenmangu Shrine, one the most important Shinto shrines in Japan. Like many shrines in Osaka, Osaka Tenmangu Shrine has witnessed a turbulent past, destroyed and rebuilt several times throughout its lifetime. 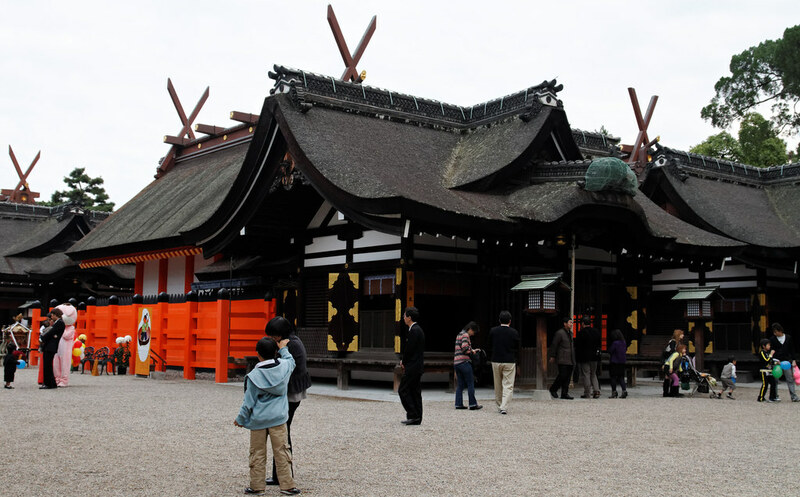 The main gate and honden (main hall) at the shrine hail from 1845 and are built to its original specifications. 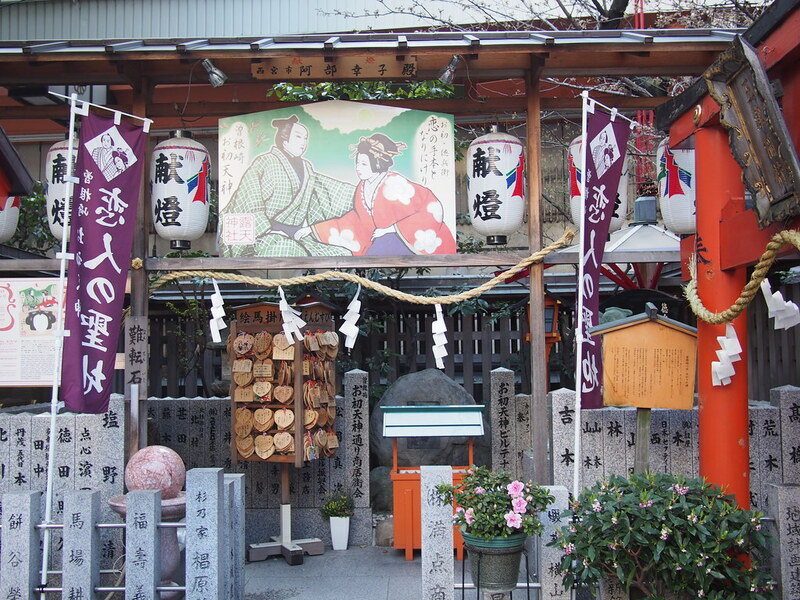 Osaka Tenmangu Shrine is dedicated to Sugawara Michizane, the Shinto deity of arts & education. Worshippers seeking a little academic enlightenment can push through the shrine’s path and offer their blessings at the altar. 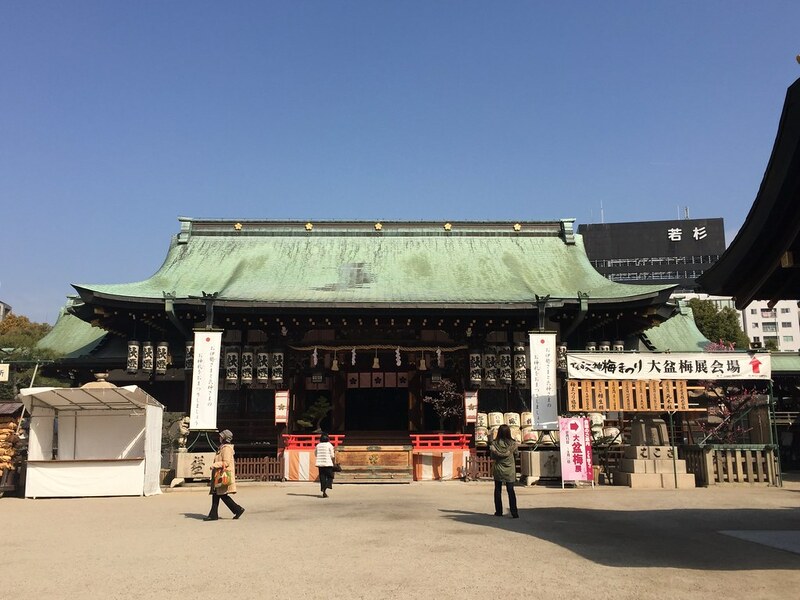 The shrine’s site is also home to the Tenjin Matsuri, one of the top three festivals in Japan alongside Gion Matsuri in Kyoto and Kanda Matsuri in Tokyo. The festival is a lively scene as its deity is paraded through the city’s streets and along the Okawa River followed by a festive fireworks show on the riverbank. While visiting Osaka Tenmangu Shrine, be sure to check out Tenjinbashi-suji Shopping Street, a two-kilometre covered shopping arcades considered the longest in Osaka–and perhaps all of Japan. The closest subway station to the shrine is Minami-Morimachi Station (Tanimachi & Sakaisuji Lines) and the adjacent Osakatemmangu Station (JR Tozai Line). From Exit 3 of the station, walk south along the street directly to the right of the exit. Follow the street for two blocks and turn left. The shrine’s main gate will be to your left. Resting in a quieter corner of Umeda, Tsuyunoten Shrine might lack the pomp to draw travellers from across the city. But this small shrine, also called Ohatsu Tenjin, more than makes up for its stature with its flair for the dramatics. 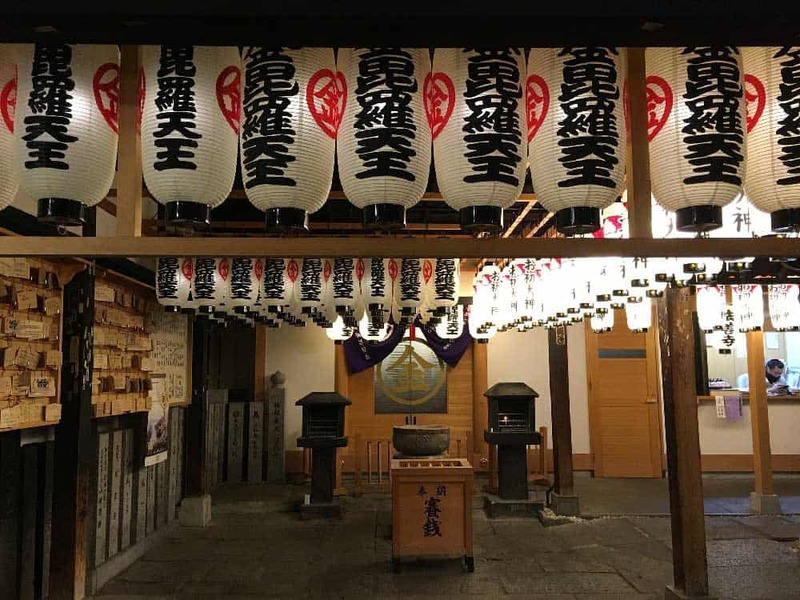 Tsuyunoten Shrine memorializes an early-16th century double suicide of a couple—one the son of a rich merchant, the other, a geisha—whose forbidden love saw little future in the material world. The shrine’s story was so popular that it inspired a popular bunraku (puppet theatre) play, The Love Suicides of Sonezaki. Today, Tsuyunoten Shrine is a hotspot for young Osakan couples seeking well-wishes for success in their own relationships. From Higashi-Umeda Station, exit to Mido-suji and walk south. One street before the Keihan National Highway, turn left. In about half a block, walk through the small torii gate to your left to find the shrine. Red Roof Inn & Suites Osaka Namba Nipponbashi: A brand-new hotel situated just steps away from the electric Dotonbori entertainment district. The modern rooms are both stylish and clean. Cross Hotel Osaka: A chill and contemporary 4-star hotel, rockin’ out a block away from Dotonbori and Shinsaibashi-suji Shopping Street. The bright rooms go beyond the usual standards, adding in luxurious extras like electronic bidet toilets and deep soaker tubs to up the comfort. Swissôtel Nankai Osaka: The best 5-star hotel in the Namba area, directly connected to Namba Station. The modern rooms here are spacious & colourful with epic city views shining in through wide windows. To solidify its spot among the best luxury hotels in Osaka, Swissôtel Nankai Osaka adds in luxurious amenities like an indoor pool and a relaxing spa.